TH E M R EP O RT | 55 O R I G I NAT I O N S E R V I C I N G A NA LY T I C S S E C O N DA R Y M A R K E T ANALYTICS THE LATEST originations increasingly favoring older borrowers over younger borrowers, whether this arises from recent changes in borrower or lender behavior. The New York Fed reported that mortgages are affected by both factors. Originations among all ages from 20 to 65 have experienced a large decline from 2004 to 2015, but the decrease was most observed among middle-aged borrowers, with a 60 percent fall in per capita originations. Meanwhile, the oldest ages (65 and up) experienced only modest declines in originations. "We see decisive evidence of a boom and slowdown in mortgage originations at most ages, which by itself would generate an older class of mortgage holders by 2015," the New York Fed stated in the report. "In addition, we observe a tilt of mortgage originations away from younger borrowers and toward older borrowers between 2003 and 2015." The report continued, "The tilting of new credit toward older ages may be an unsurprising consequence of credit tightening, when one considers the close relationship between credit risk score and age. Clearly higher-risk score standards in underwriting affect younger borrowers differently than they do older borrowers." In addition, younger borrowers are affected by growing student debt, which could hinder their ability to obtain a mortgage loan. "Hence, the aging of the American borrower bodes well for the stability of outstanding consumer loans. At the same time, the likely combination of muted credit access and lower demand for credit that we observe among our younger borrowers may well have consequences for growth," the report explained. "The graying of American debt that we observe between 2003 and 2015, then, might be interpreted as a shift toward greater balance sheet stability and away from credit- fueled consumption growth." 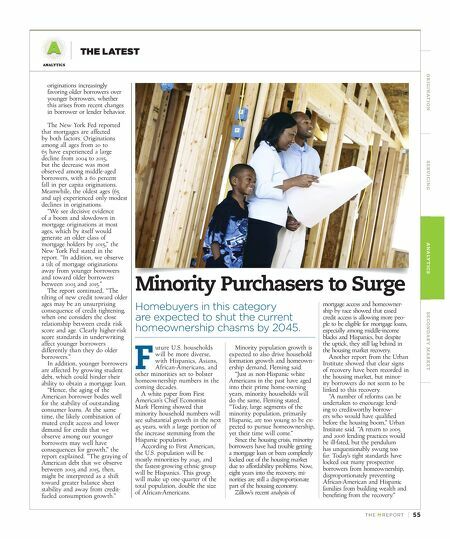 Minority Purchasers to Surge Homebuyers in this category are expected to shut the current homeownership chasms by 2045. F uture U.S. households will be more diverse, with Hispanics, Asians, African-Americans, and other minorities set to bolster homeownership numbers in the coming decades. 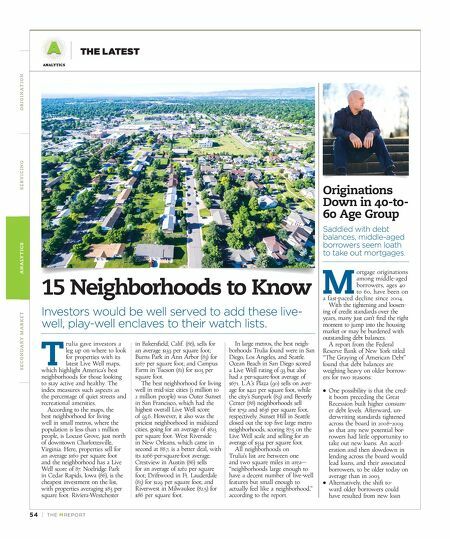 A white paper from First American's Chief Economist Mark Fleming showed that minority household numbers will see substantial growth in the next 45 years, with a large portion of the increase stemming from the Hispanic population. According to First American, the U.S. population will be mostly minorities by 2045, and the fastest-growing ethnic group will be Hispanics. This group will make up one-quarter of the total population, double the size of African-Americans. Minority population growth is expected to also drive household formation growth and homeown - ership demand, Fleming said. "Just as non-Hispanic white Americans in the past have aged into their prime home-owning years, minority households will do the same, Fleming stated. "Today, large segments of the minority population, primarily Hispanic, are too young to be ex - pected to pursue homeownership, yet their time will come." Since the housing crisis, minority borrowers have had trouble getting a mortgage loan or been completely locked out of the housing market due to affordability problems. Now, eight years into the recovery, mi - norities are still a disproportionate part of the housing economy. Zillow's recent analysis of mortgage access and homeowner - ship by race showed that eased credit access is allowing more peo- ple to be eligible for mortgage loans, especially among middle-income blacks and Hispanics, but despite the uptick, they still lag behind in the housing market recovery. Another report from the Urban Institute showed that clear signs of recovery have been recorded in the housing market, but minor - ity borrowers do not seem to be linked to this recovery. "A number of reforms can be undertaken to encourage lend - ing to creditworthy borrow- ers who would have qualified before the housing boom," Urban Institute said. "A return to 2005 and 2006 lending practices would be ill-fated, but the pendulum has unquestionably swung too far. Today's tight standards have locked out many prospective borrowers from homeownership, disproportionately preventing African-American and Hispanic families from building wealth and benefiting from the recovery."